When you delete someone you have as a friend on Snapchat, it works almost like a block, unless the big difference is that they can still send messages and snaps to you, only that it will say “pending” until you add them again. Do they know that you have deleted them? Can they still send you Snaps? Will they be able to view your Stories? When hearing these questions, it makes you wonder “Why does it matter?” What is done is done is done. But it is still interesting to know what actually happens, and that’s what we’ll write about today. 2. They will not be able to view your story – unless it is set to public. If your story is set to public, anyone can watch your stories without being friends with you. 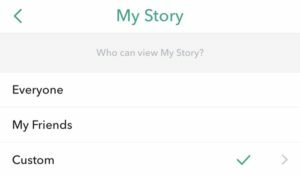 To change the settings of who can watch your Stories, go to the main screen, tap the cogwheel in the top right corner, scroll down until you see “Who can…” and “View My Story” right below it. Tap “View My Story” and choose your preferred settings. 3. When the person you removed sends you a snap or chat, it will say “Pending” instead of “Sent”. 4. When they search for your username, your username will be displayed in a white colour instead of purple. This is an indication that you have removed them. 5. If you’re curious to know if they will be able to tell if you have deleted them, the answer is yes. On your main interface, you can see a list“Snapchatters who have added you back”. When they check that and don’t find your username, they will be able to know.